We just got back from a relaxing and fun beach vacation with my family. It was Ella's first time at the beach and while I was so excited to share this new experience with her, I was also stressed and nervous. 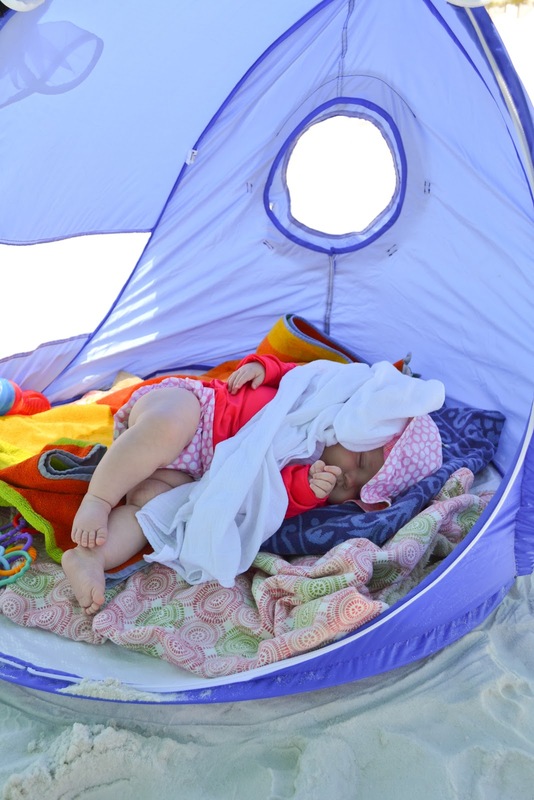 Babies and sand just don't seem to mix to me - not to mention sun and water safety and coordinating feedings and naps. I tried reading blogs and using Pinterest to get some useful tips but I mostly found adorable photos of babies on the beach and super cute bathing suits (I'll be sharing some of that too of course) but first here are some items that helped make our beach vaca a super fun success. sun tent. swim float. baby powder. Aden&Anais blankets. hand & face wipes. sunscreen wipes. sunscreen. 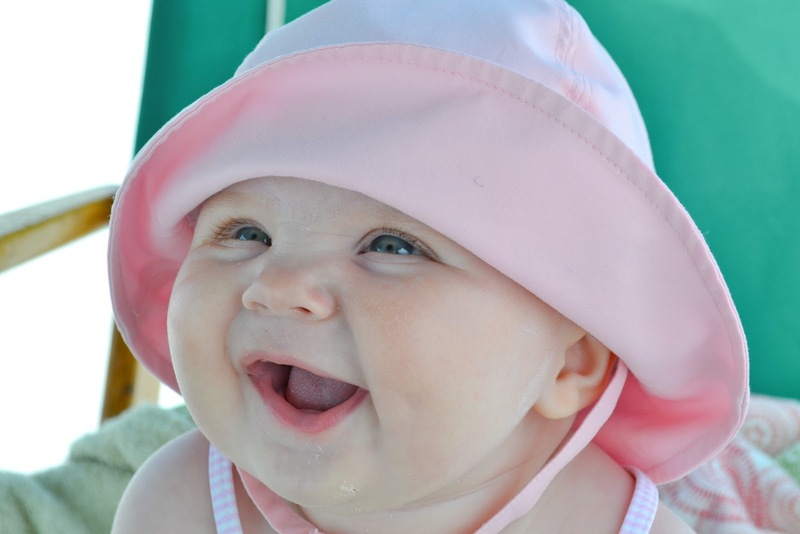 sun hat. swim diaper. 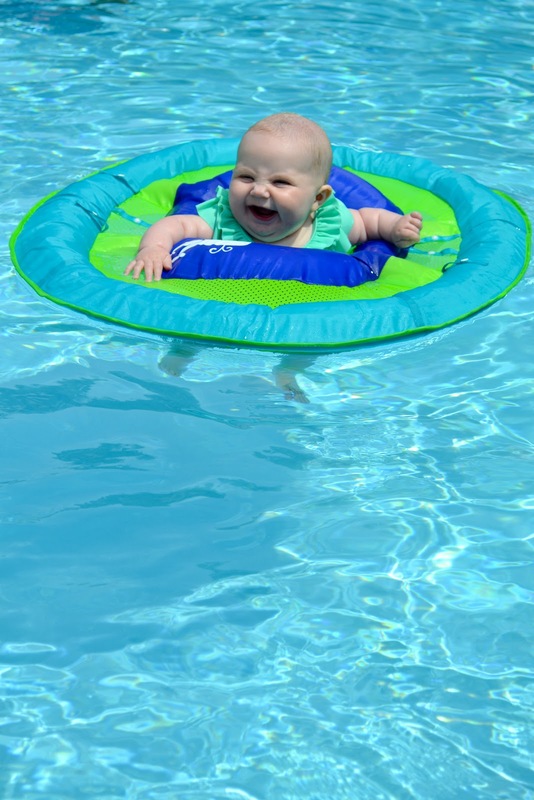 baby pool. 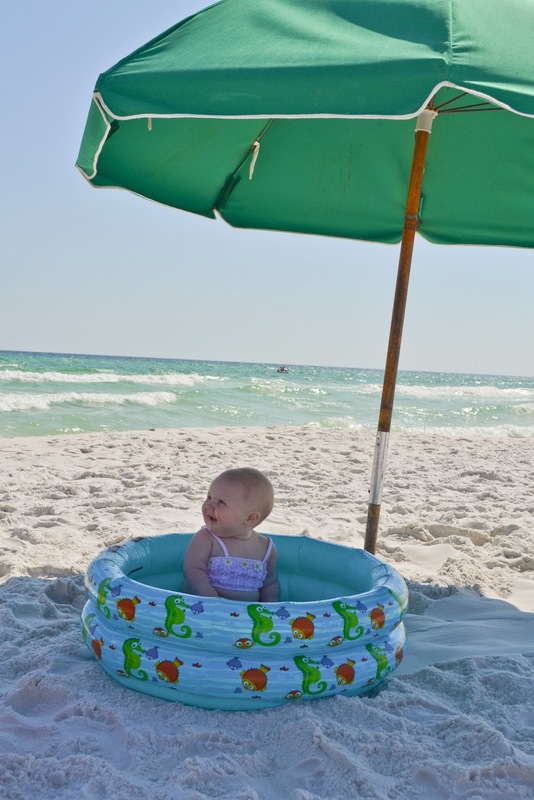 I can't tell what I loved more, the small sun tent or the tiny swimming pool or which one Ella loved more. 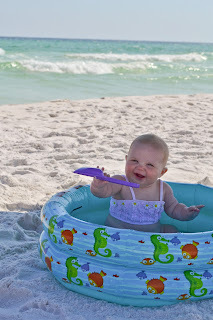 Both were perfect for keeping her out of the sand which she loved - to eat. 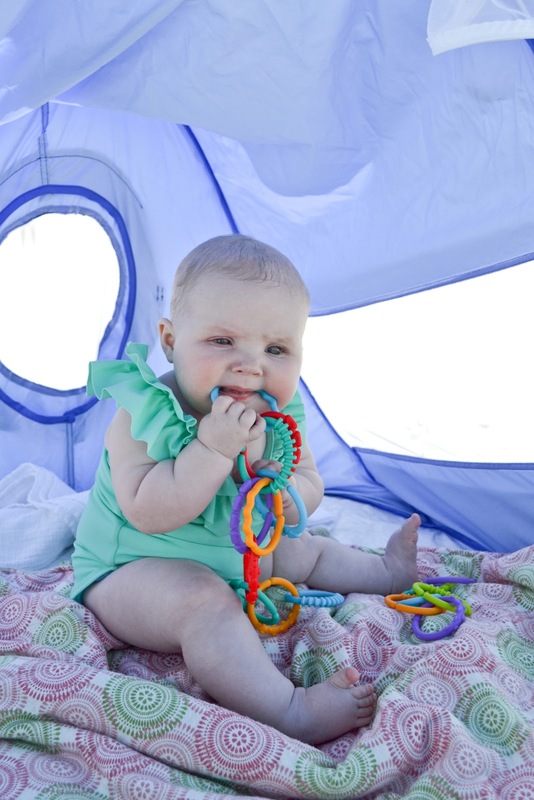 The sun tent was great for staying cool while she played or napped. I was actually able to sit back in the sun and relax while reading a book...that's right. I read a book. 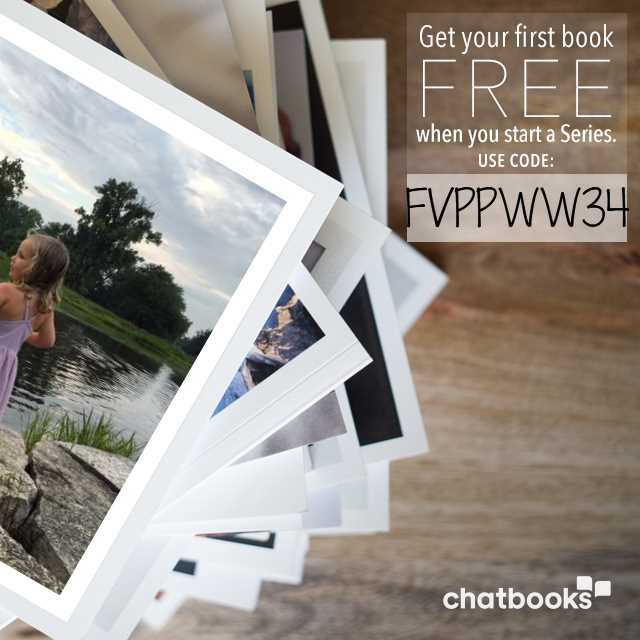 A whole book. The pool required a bit more (a lot more) attention but it was so fun to play with her in the water in a safe and controlled environment. 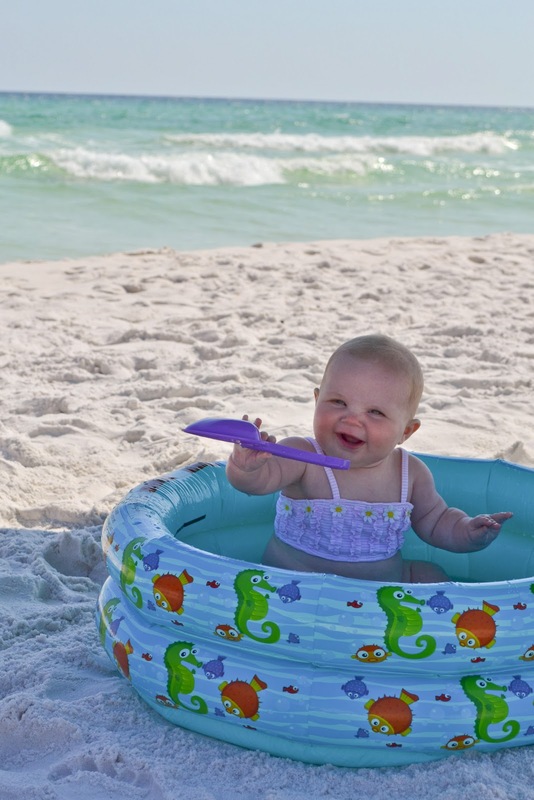 We would occasionally take some dips in the ocean and play in the waves but with a small baby it was more comforting to let her splash in the pool and play with her buckets and shovels. 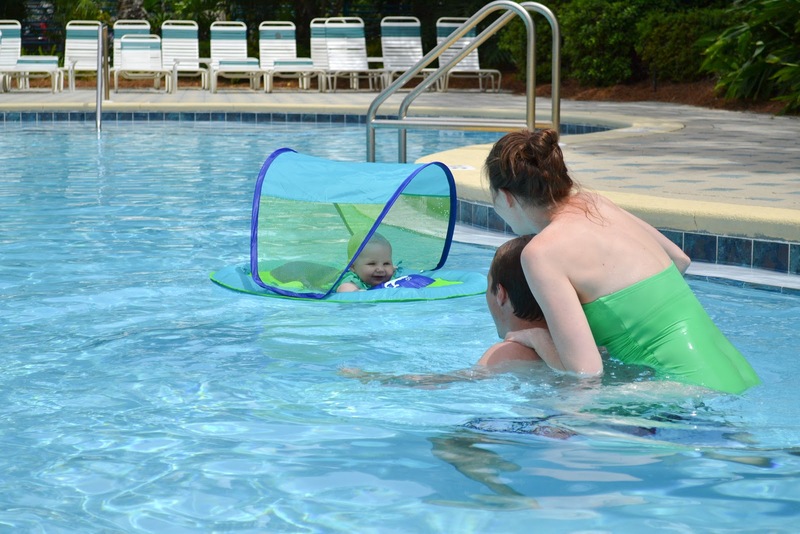 The Swimways baby float was perfect for the pool. 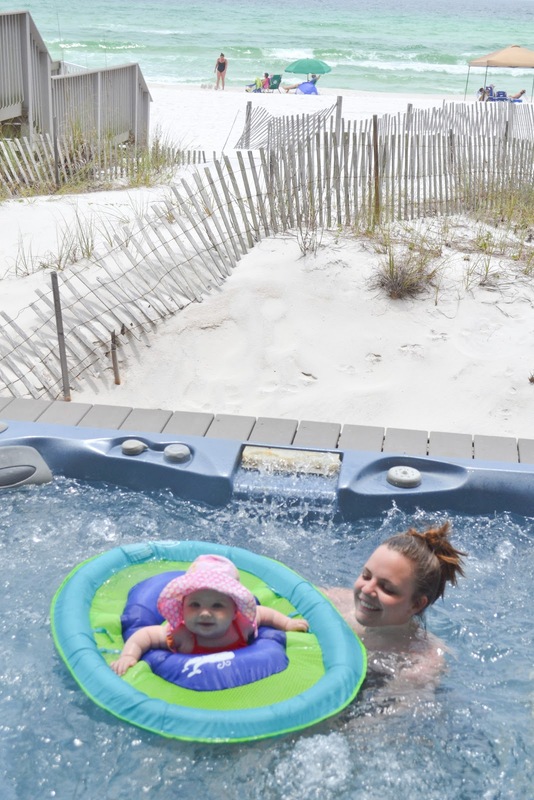 Ella loves the water and she loved being able to kick her little legs and our arms loved being able to do nothing. Really the thing that makes this float is amazing is the canopy and the fact that it collapses into a small little circle that fits in the case. Thank you Aunt Kathi! While blankets and the beach don't typically mix I found that they were pretty necessary. Napping just isn't the same without something to cuddle and no one walking by on the beach wants to see me nursing. Ella and I don't heavy blankets suffocating us though so the thin, cotton gauze blankets by Aden & Anais were cool and comfortable. One thing I did learn from Pinterest/blogs was that baby powder easily removes sand from skin. Try it. I also used hand & face wipes to help keep her hands and face clean and free of sand. 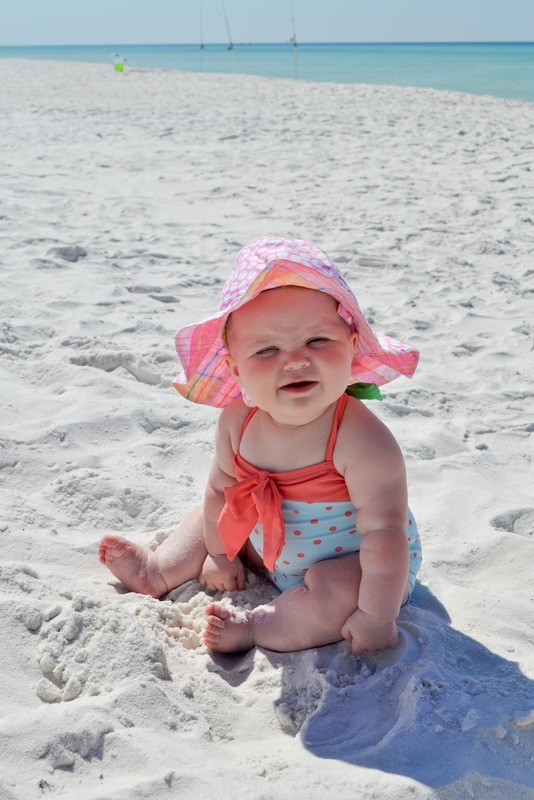 Obviously sunscreen is the number one priority for babies at the beach. 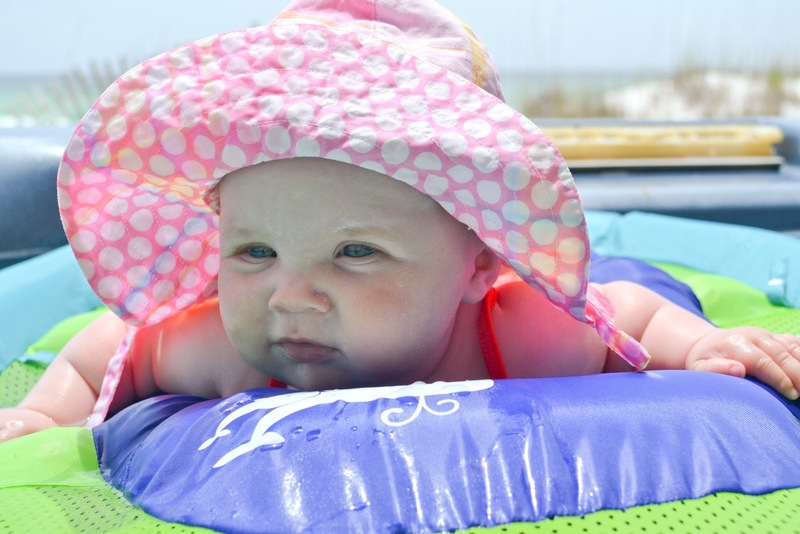 Their soft baby skin is so sensitive and susceptible to the harsh sun rays. 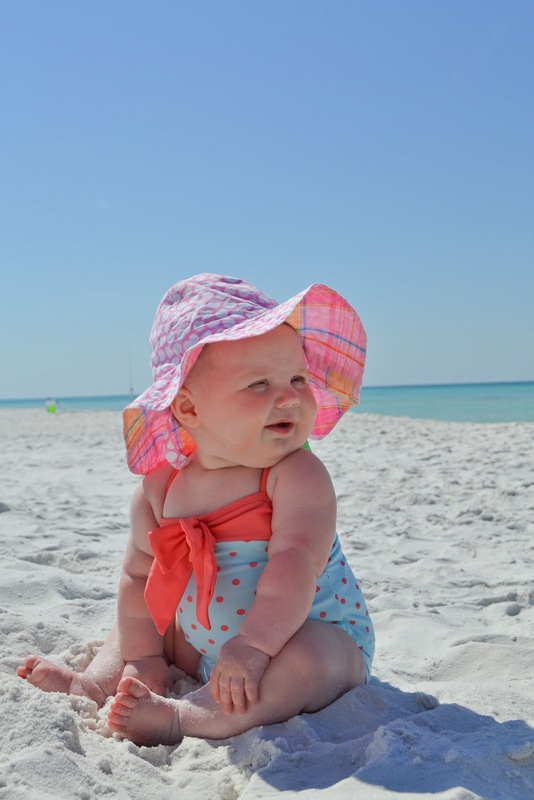 My favorite sunscreen was babyganics. It was easy to apply and really stayed on the skin through lots of fun playing. One thing I had heard about before we left for the beach was sunscreen wipes. I didn't have much luck finding them in a store by me and didn't have time to order online but I really wanted to use these wipes for applying sunscreen to her face and head. I have heard these work great. I think they would also be really helpful for re-applying sunscreen once you are already at the beach. I don't know about you but I HATE applying sunscreen on the beach with the sand. These seem to be much easier and less mess. 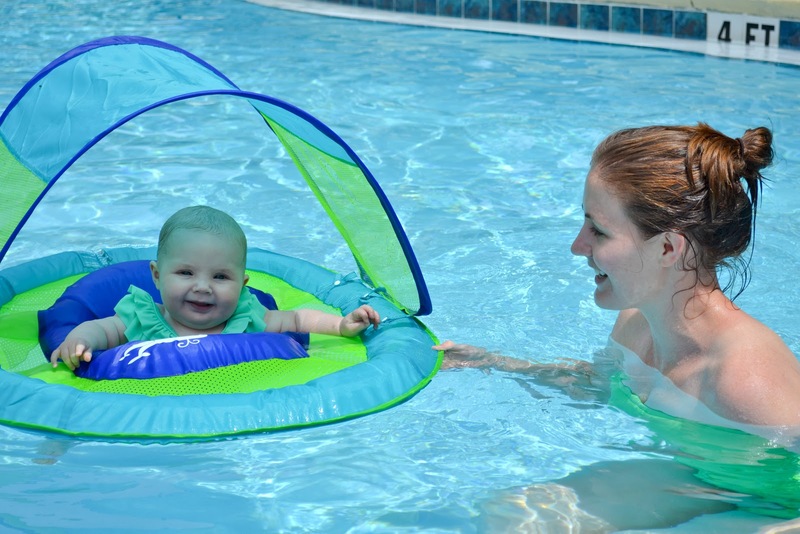 I plan to use these this summer for the pool and lake and will let you know what I think but I thought it was worth sharing they exist with you. And they do come highly recommended. 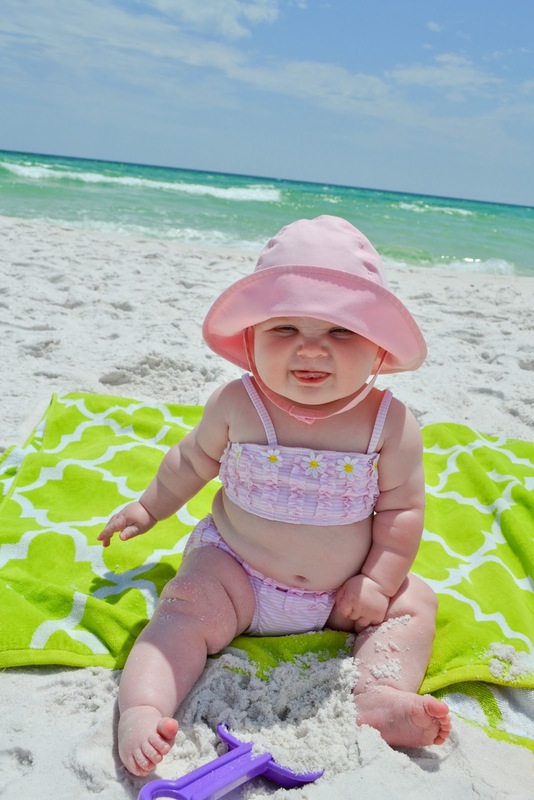 Two other essentials were the sun hat and swim diaper. The sun hat was really important for protecting her baldy but I learned the hard way that a chin strap is quite essential. 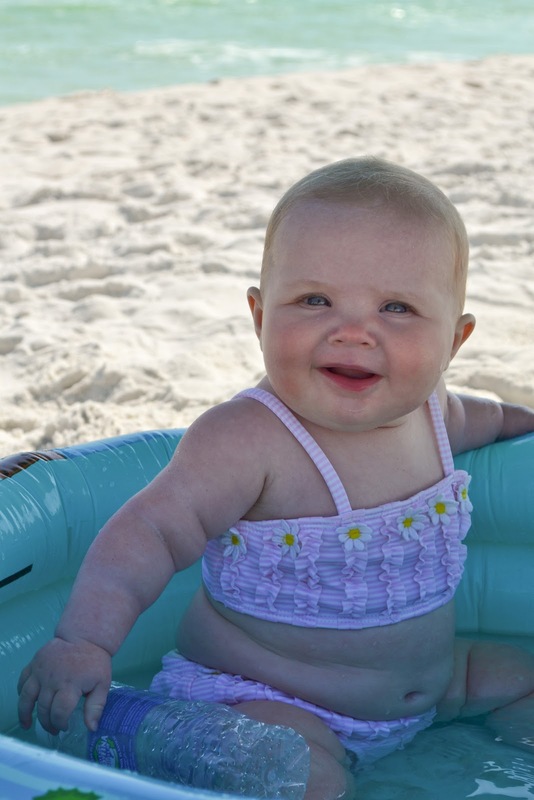 I used both disposable and washable swim diapers. I had not issues with the disposable but I chose to invest in some washable diapers because we will be spending LOTS of time at the lake and pool. Plus the washable diapers just seem so much softer and more comfortable for the babies. I would rather wear fabric. 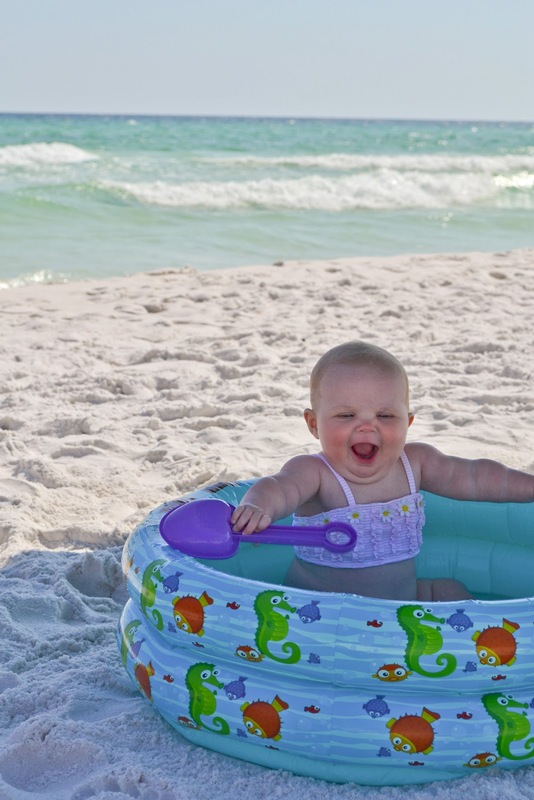 Hope this is helpful as you plan your next trip to the beach with little ones. If you have any other suggestions or products that worked for you please share. Happy Summer!! She is sooooo adorable! 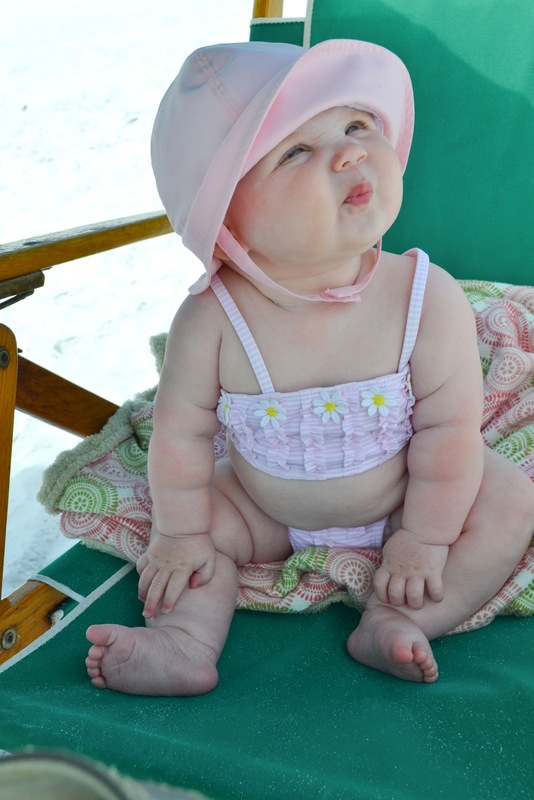 I want to just squeeze those rolls!! 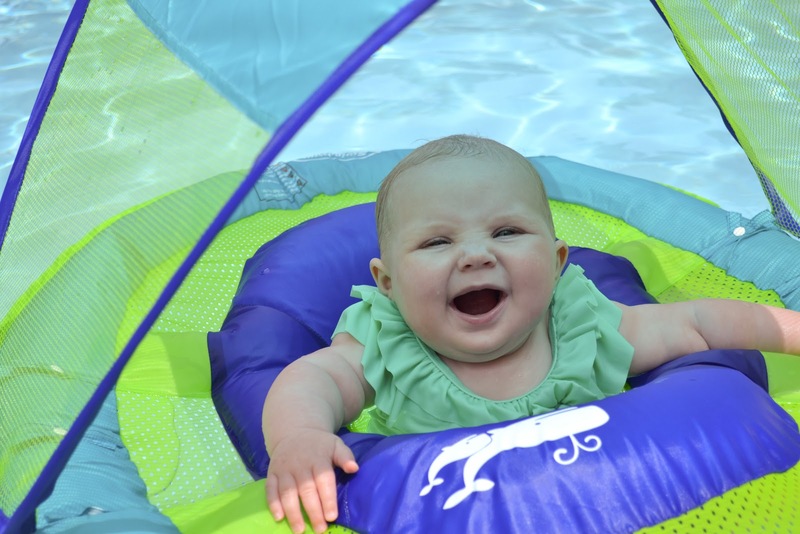 Where did you get your baby pool from? 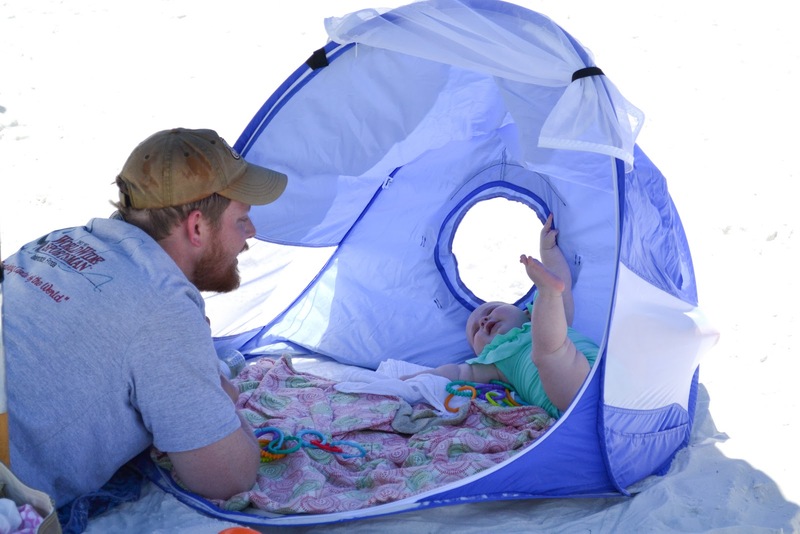 Could you share the name/brand of the sun tent? Thanks! Kimmycon, I'm sorry I accidentally deleted your comment and can't retrieve it but in response to your question I did find that the first week I used the tent the wires broke because I kept folding it up wrong. I brought it back to BuyBuyBaby and they replaced it. I learned the right way to fold it and have had the tent for a year with no issues. The beach is generally the very best location to visit escape the cold inland winters as a result of the moderate temperatures experienced year round. Learn about Contact Us | Camp Shores on campshores.com. 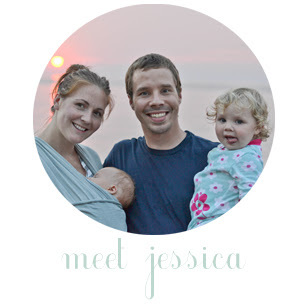 Visit Jessica's profile on Pinterest.